THE SOUR SIDE OF SWEET. The advertisements make sugary drinks look good, but they don’t show the whole picture. Sugary drinks can lead to long-term weight gain and obesity, which can increase your risk of developing type 2 diabetes, high blood pressure, and heart disease. They can also lead to tooth decay. People may not realize how easy it is to consume high amounts of calories by drinking sugary drinks, juice drinks, sports drinks, sweetened tea and coffee drinks. Just one 20 once bottle of soda can pack over 70 grams of added sugar – that’s more than 250 calories of poor nutrient value. For a healthier New York, don’t drink sugary drinks and avoid giving them to children. What is the difference between type 1 and, type 2 diabetes? A patient with Type 1 diabetes cannot produce any insulin at all. Insulin is the hormone that we need to control the glucose in our body. The glucose levels goes up when we consume carbohydrates. Type 2 diabetics produce some insulin, and may produce excess, but your body is resistant to that insulin, and therefore, cannot use it effectively—resulting in high blood sugar. Generally speaking, people with type 1 diabetes tend to be younger. They can be diagnosed anywhere from birth, tend to be younger than 40 years old, but there are cases where you diagnose Type 1 in people up to the age of 70 years old. Type 2 diabetics tend to be diagnosed as adults. But now we are actually seeing a larger proportion of pediatric patients because of the obesity epidemic. The only medication for Type 1 diabetes is insulin which is injection. Type 2 diabetes can be controlled with some oral medication, diet and exercise. making everything worse. You feel tired, you get blurry vision, because the extra glucose leads to eye swelling. You also lose weight. But if you screen and follow up with your PCP regularly, you can hopefully get a diagnosis of prediabetes or diabetes and then you can delay or prevent those symptoms from occurring. How do you avoid or delay the onset of Type 2 diabetes? First things first: activity, activity, activity. Everyone’s busy, with work, kids, studies, it’s hard to exercise 30 minute a day, five times a week. By doing simple things like taking your dog for a walk, getting off the train one or two blocks earlier and walking, you can burn a significant amount of calories. Twenty-five percent of the population with diabetes doesn’t know they have it. Anyone over the age of 45 should be tested, absolutely, or anyone with risk factors of being overweight, physically inactive, (having a BMI (body mass index) over 25 or family history should be tested. You can get heart attacks, strokes. Other complications are microvascular; they affect the smaller vessels in our body. That includes kidney disease. It also leads to eye disease. If you diagnose and treat it early enough can you prevent these complication? Absolutely. These complications occur because of uncontrolled diabetes. You can control diabetes by diet or lifestyle ,or if that’s not enough, medication. Whether it’s by oral medication or insulin, you can absolutely prevent the progression of these complications. Nigel Hunt is a License Massage Therapist and Fitness Trainer located in Jersey City. He is available for free consultation regarding massage, health, fitness, nutrition, and exercise. Visit his website at www.M4hf.com or call him at 646 320-8999. Remember, it’s never too late. 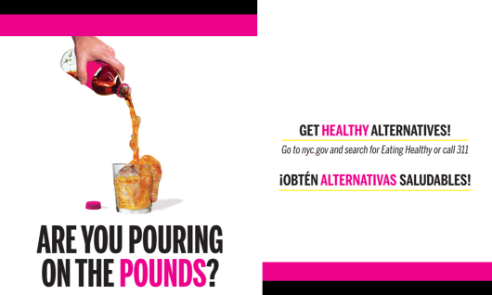 Visit nyc.gov/health and search ‘sugary drinks’ to learn more.